HeArtists at work, creating paintings and cards for Grateful Heart painting recipients, at the Calistoga Art Center in October. HeArtist at work, creating artwork for a card that will be sent to one of the Mutual Aid organizations that sent firefighters and a truck to help us. We are grateful to the many people and organizations who helped protect Calistoga and Calistogans from fire, and who helped us get back on our feet! 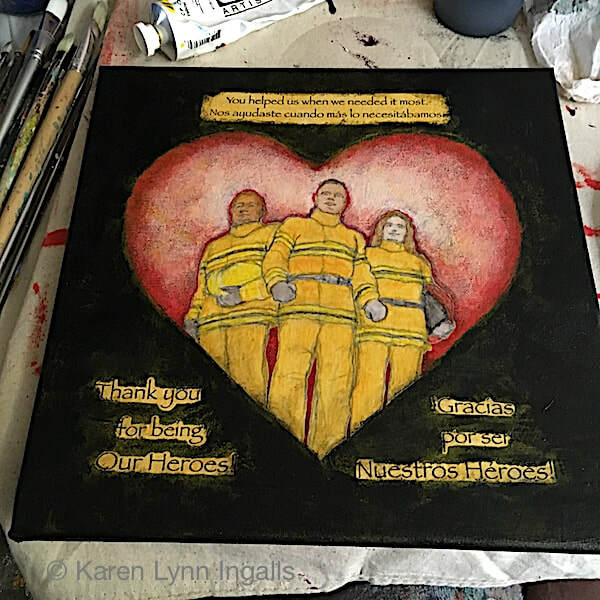 We're creating paintings to thanks them, and to recognize their heroism, their commitment, their caring, and their kindness. Estamos agradecidos con las muchas personas y organizaciones que ayudaron a proteger a Calistoga y a sus ciudadanos del incendio, y a esos que también ayudaron a que nos recuperáramos. Estamos creando pinturas para agradecerles a todos ellos y para reconocer su heroísmo y bondad. Would you like to join us? Plan on coming all four times, or at least three of the four time, so you can complete both your painting(s) and frame(s). ¿Te gustaría unirte a nosotros? Entonces, ¡planea en venir las cuatro veces! R.S.V.P. in English below, or call Karen at (707) 942-0197. That way she'll make sure she has enough materials and snacks! Materials are provided. Responde (en español) a: Teresita Nuño al correo electrónico teresitadejesusnuno (AT) gmail.com. 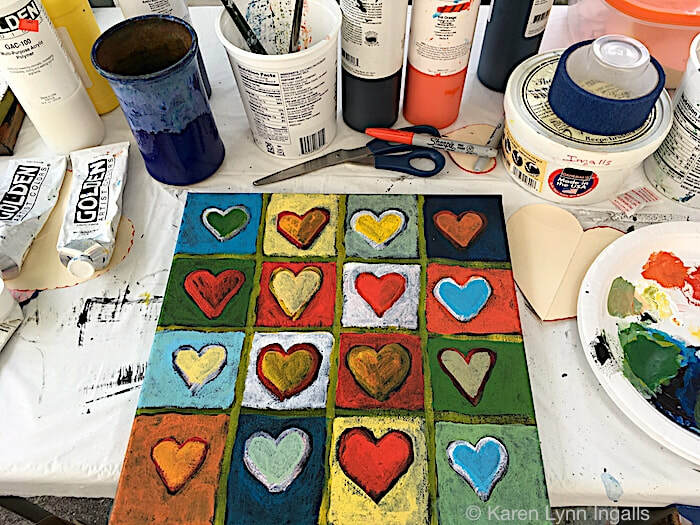 We will be making Heart Art for Calistoga — beading together hearts for Calistoga trees, painting rocks, and sculpting hearts — to inspire love, kindness, and compassion with the power of art. Can you join us? R.S.V.P. to Karen by email through the Contact Page, or call her at (707) 942-0197. That way she'll make sure she has enough materials and snacks! We'll meet in front of Silverado Ace Hardware, on Lincoln Avenue. Bring a friend — and a six-foot ladder, if you have one! Patti Wessman and Karen Lynn Ingalls hold Tree Heart Art ready for installation (thanks to Kathleen Edson for taking the photo!). Students at St. Helena Elementary School create Heart Art for the auditorium, for the music program's concert. Tree Heart Art in the process of being assembled. 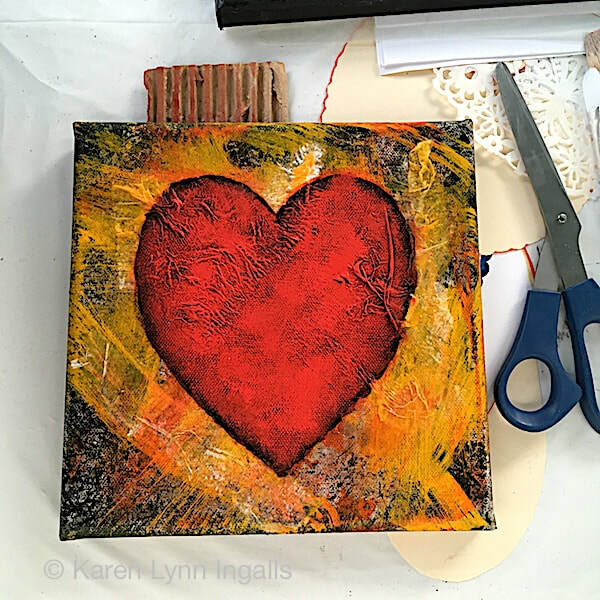 ​Come join us for our Big Finale Make-a-Heart Day, as we get the Heart Art ready to go up in both Calistoga and St. Helena! We'll be assembling all the parts, so they'll be ready to go up. One of the projects is to finish putting together the Tree Heart Art installations that will grace the trees all along downtown Calistoga. The second project is to put together the Heart Art created by students of St. Helena Elementary School, which will beautify the auditorium and its entrance for the school's music program concert (where the whole concert is centered around the theme of love, kindness, compassion, and friendship). ​Materials will be provided. Snacks, coffee, and tea will be here for you, too — but you're welcome to bring along lunch and anything else you may want to munch on while you're here. If you have jewelry-making tools for beading, especially long-nose pliers or crimping tools, bring them along! 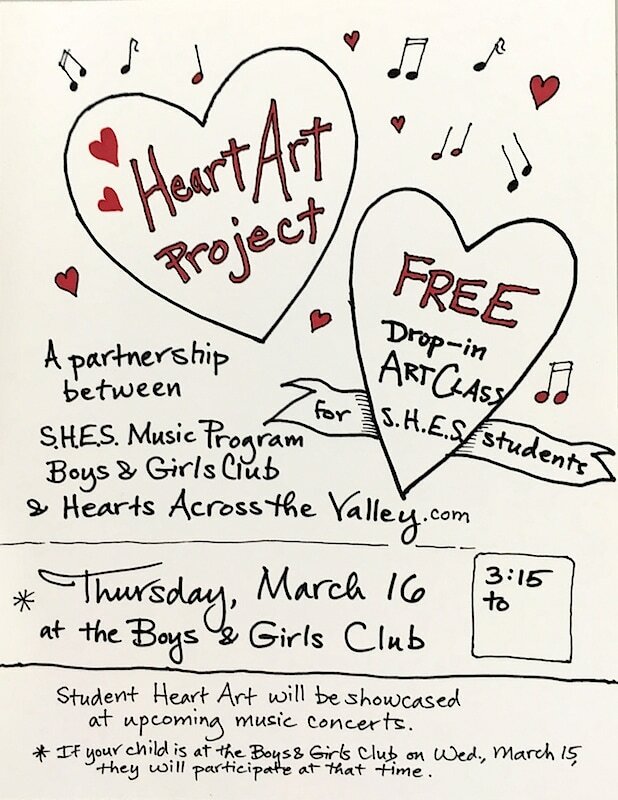 All students of St. Helena Elementary School are invited to create heart art at the Boys and Girls Club! You'll be able to see all the artwork created, in the entrance to the auditorium at St. Helena Elementary School, at the music program's spring concerts on Thursday, March 23 and Thursday, April 6, 2017. This is being created in partnership with the St. Helena Elementary School general music program, with music teacher Laura Condylis, and the St. Helena Boys and Girls Club, with Program Director and Art Director Kari Martin. Heart-makers at the first Make-a-Heart Day at the Calistoga Art Center in early January. 10 AM - 1 PM and 1 PM - 5 PM — or bring your lunch and come all day! ​Come join us to create some of the hearts that will grace art installations throughout downtown Calistoga! Materials will be provided. Wear old clothes you can paint in! We'll be painting and making hearts all day long. Snacks, coffee, and tea will be here for you — but you're welcome to bring along lunch and anything else you may want to munch on while you're here. Please let Karen know you'll be coming, by giving her a call at (707) 942-0197 or using this website contact form. 10 AM - 1PM and 2 PM - 5 PM — or bring your lunch and come all day! Come join us to create some of the hearts that will grace art installations throughout downtown Calistoga! Materials will be provided. Wear old clothes you can paint in! We'll be painting and making hearts all day long. Snacks, coffee, and tea will be here for you — but you're welcome to bring along lunch and anything else you may want to munch on while you're here. Please let Karen know you'll be coming, using this website contact form.